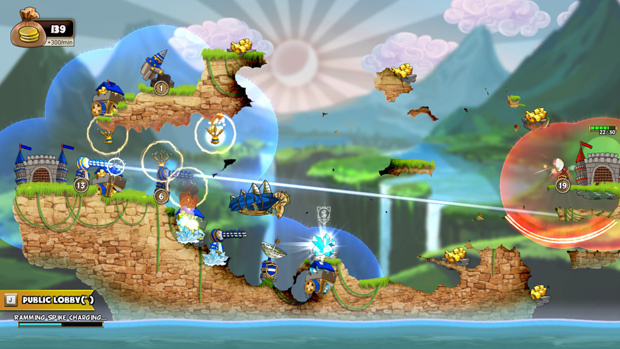 Cannon Brawl is a title that really blew me away (no pun intended). It is a bold indie title, coupling destruction and explosions with constant, action-packed excitement. 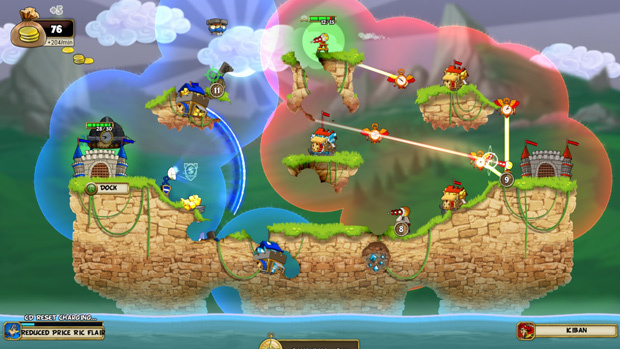 Cannon Brawl offers action-strategy on a 2D plane, similar to the Worms franchise where two sides do battle on a map riddled with obstacles and material to destroy. 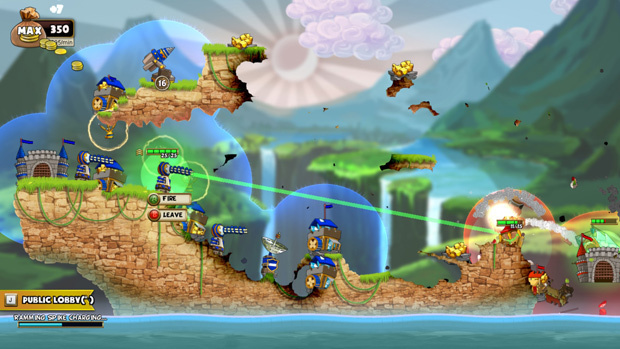 Set up mines, prepare laser turrets, cannons, and even nuclear warheads! You must constantly be aware of everything happening on these deceptively small maps, commanding your airship as well as your other buildings, managing them with grace and speed. There is a lot to do, from a fully fleshed out Campaign, Nightmare Mode challenges, bots to practice against, as well as PVP. As a fan of strategy games, this was a breath of fresh air for me. While the graphics might seem cartoony and light, and the story mode becomes arguably easy, the PVP will make this game stand out amongst the horde of games on Steam. A competitive game that has an infinite amount of possibilities and strategies to try will surely have fans coming back to test their mettle online. 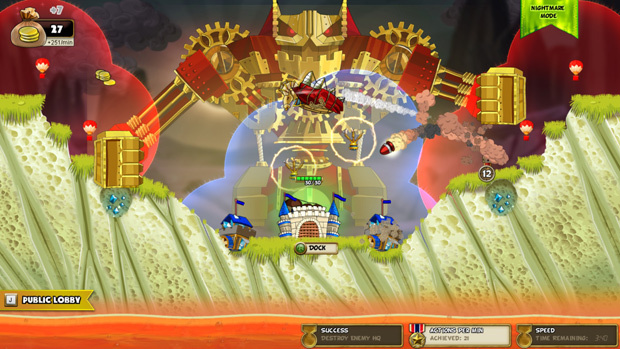 In Cannon Brawl you begin as the Princess, who is out to save the land and her people with just an airship, a castle, and a few errant buildings. The flow of the gameplay appears simple but nothing could be more wrong. 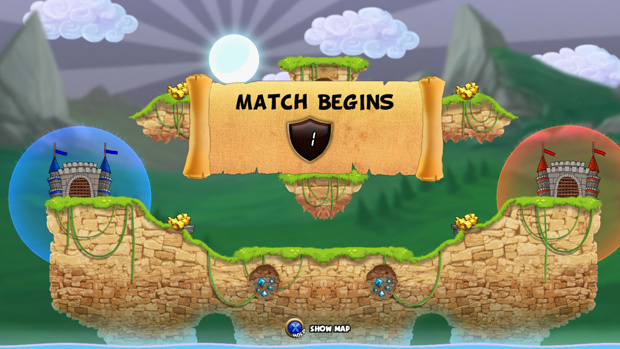 The matches begin with a map with two castles and resources to farm. Oftentimes there will be hills or outcroppings in the air to block or position your cannons upon. However, you cannot simply just build anywhere you like! There are pylon-styled buildings to create, in the form of air balloons (though other types of pylon are available) that give you a certain amount of space in which to build. 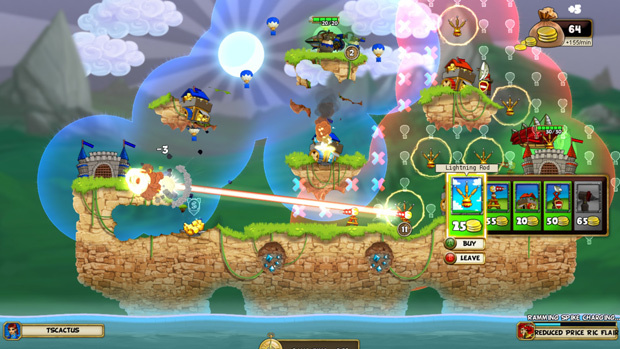 You can destroy your opponents’ balloons as well as interact with your own; the platforms can position buildings atop and the lightning rods can be fired through with lasers for increased damage. It is important to note that the ground can be destroyed as well. A good reason to do this would be to acquire a diamond node (for currency). You may also shoot the ground from underneath enemy structures using lasers, missiles, cannons or the ever-popular drill (which arcs up and then down into obstacles). While the way to win the matches is to destroy your opponent’s castle, there are a variety of options available to you, like sinking a castle via knocking the ground from under it! It can feel like it takes forever to unlock new buildings and pilots, but simply going through the story mode and Nightmare Mode can unlock the pilots; gameplay will get you your building unlocks. There is no pay-to-win here. Currency to unlock things not in the main story can be gained by winning battles, and completing quests which will reside on the main menu. 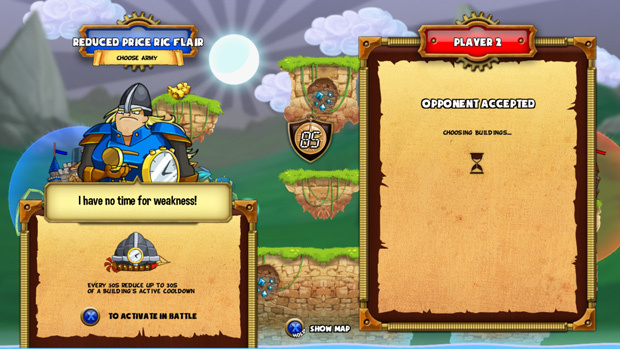 There are a few gameplay modes to be aware of in Cannon Brawl. First is the Campaign. It is a pretty straight-forward, no-frills story that one is accustomed to. While a complex detailed story would normally be very much appreciated, getting right into the nitty-gritty of the gameplay is certainly nice. As the story progresses more characters are unlocked, and the player can get used to the maps on offer. Each map offers its own challenges and strategies to attempt to employ, so going through the story mode first is a great way to get ones feet wet and start getting more characters to use as each one brings something different to the table. After you finish the story there is Nightmare Mode which has its own collection of challenges, puzzles and difficult encounters. As you progress the missions grow more and more difficult, culminating in a Final Boss Battle against the evil Uncle’s giant robot! Without spoiling the fight, it’s quite the task and really made the tests and puzzles worth doing. Finally there are bots which are primarily just for practice and testing ideas on. They have several difficulties, ranging from Easy to Insane, each one living up to their name. These modes are okay on their own and help prepare you for the real gem of this game. Player vs. Player really stands out in this game. While A.I. is all well and good, testing oneself against other players is far more exciting! There are a few options here, from ranked, casual, or inviting a friend to a match. 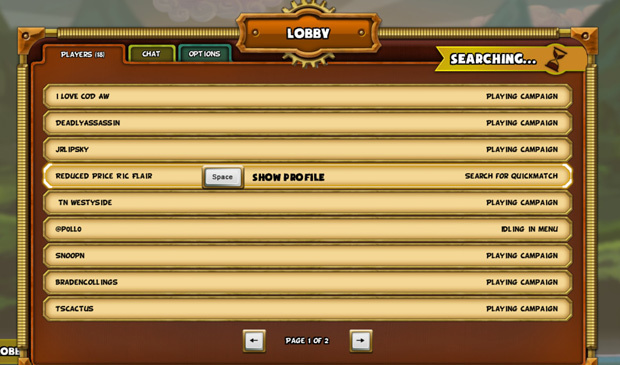 The lobby is pretty nice with a tab to chat with other people waiting or perhaps throw the gauntlet down to whoever is strong enough to take you on! What makes this better than the PC? Players constantly come up with new and interesting ideas on the fly, whereas the A.I. can only go so far. I was thrilled to see ideas I came up with just rummaging through the defensive and offensive items being utilized so well. Made me see I was doing something right (even when losing!). Devising a strategy is of the utmost importance though; each Pilot has their own ability that may aid your cause, or put you at a disadvantage depending on what you need. For example, the Taskmaster resets cooldowns while the Smuggler offers an extra slot for buildings. There are so many different ways to play this in PVP that I could write a whole article on the art of strategy in Cannon Brawl. From lasers, bombs, missiles and drills, there is something for everyone. Just remember that the same set up will not guarantee a victory. One addition I would love to see is an option to save builds to keep builds that you particularly are fond of. While it may feel like a relatively simple title at first, I genuinely feel there is a lot to offer in this game. Some might find the graphics to be a little childish and cartoony, but I like the simplistic style. It does not leave so much on the screen to distract from what is really important: destruction! As the community for this game grows, so will the plethora of ways the player will devise to break down the others defenses. I do not have many complaints other than the time it can take to unlock items and the amount of maps; however there is plenty to sharpen one’s teeth on and learn how to play the game. Again the graphics are kind of cartoony and simple, but I do not think it in anyway detracts from the gameplay. In fact I think this style of art helps a game like this. It can be very frustrating to see objects on the map that only disguise or hide potential benefits to either side, and this keeps the game ultimately fair. Perhaps in the future the environment can change while the game is going on? That would be something really interesting. The controls for this game are pretty solid, and I love that I can use a controller for a game like this. Keyboard and mouse are all well and good, but I prefer to fly and place using my trusty PS4 controller. The controller feels a little over responsive sometimes (in menus particularly) and sometimes I had a little problem aiming with the controller but those moments were far and few between. While there are just a few game modes, they are all very solid and enjoyable. The story mode is simple and easy to get into without being horribly boring; the character names are admittedly kind of plain but this is not something that will terribly bother me in the long run. Nightmare mode is a blast and the PVP is constant and entertaining everytime I play. The sounds for this title are a hoot! The sizzle of lasers, the detonation of various explosions, missiles and drills hammering into the ground are all pretty fantastic. The music is booming and appropriate on the title screen, really setting the tone for an action-packed experience. Bring new Champions into the battle and use their powerful skills to slice through your enemies.